Place flour in a mound on a clean work surface. Make a well in the centre of the flour. Crack 4 eggs and oil into the centre of the well. Use a fork to whisk the eggs, gradually drawing in the flour as you go until the dough becomes thick. Use your hands to bring the dough together. Knead for 5 minutes or until smooth and elastic. Shape the dough into a disc and coat lightly with flour. Wrap in plastic wrap and set aside for 30 minutes to rest. Divide the dough into 4 equal portions. Use the palm of your hand to flatten the dough. Set the pasta machine on the widest setting and coat the pasta rollers lightly in flour. Feed one portion of dough through the machine. Repeat six more times, folding the pasta into thirds and then turning it 90 degrees to the pasta machine before you feed the pasta dough through each time. Continue to feed the dough through the machine, gradually narrowing the pasta machine settings, one notch at a time. When you reach notch five, lay the pasta on the bench and on one half of the sheet place an eighth of the thinly sliced truffle. Fold the pasta over to sandwich the truffle inside the pasta then feed the dough through the machine again, gradually narrowing the pasta machine settings until you reach notch four, then repeat with the remaining three dough portions. Set the pasta machine to the linguine setting and feed the pasta sheet through. Lightly coat the linguine with flour to stop it sticking together. Repeat with the remaining pasta sheets. Cook the linguine in rapidly boiling salted water. Once it has risen to the surface of the water, cook it for 1 minute and it will be done. Toss cooked linguine with olive oil, three quarters of the parmesan, sea salt, pepper and chives. To serve, place linguine in individual pasta bowls. Drizzle with olive oil and sprinkle with the remaining parmesan. 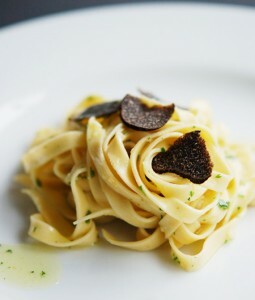 Garnish with the rest of the shaved black truffles.